It's Pep Rally week and we are here today to share a sampling of the NEW Paper Smooches AUGUST release with you! Four new stamps and EIGHT new dies will be available to purchase on July 31st at 8:00pm pacific time. Once our release goes live, you will find our new products HERE. Deadline: You have until midnight PT on Sunday, August 4th to leave a comment. Emily is taking a small hiatus to care for different things in her life. Kathy Racoosin is filling in for her. We are so excited to have Kathy join us in August! I die cut my easel using woodgrain paper for a bit of realism:) Then I stamped my sentiment in two different colors. On the card base, I used a scrap piece of paper as a mask to create rays of sun with ink and a blending tool. The rainy clouds were made using one of the Landscape dies blended with some soft blue ink. The "raindrops" are just water drops dripped and flicked over the water-based ink. That's it! Thanks for hopping with us today! The next stop on the hop is the fantastic Kalyn Kepner! Have a wonderful day guys! A perfect use of water effects! And a lovely card! I just love your cards. They are always creative and beautiful! 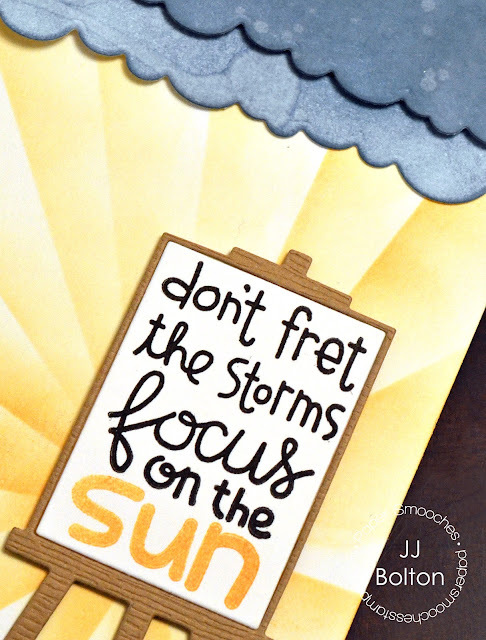 Its fun to see the sun at the bottom of the card lifting up the clouds! I love this sentiment so true I shared on Facebook and my blog! Love the saying on this card. What a great message and encouraging card! Your easel and sun card is marvelous - and certainly a delightful way to lift someone's spirits! Fabulous showcase! Precious, and true, JJ... love it! Sunshine gets the majority of it. BEAUTIFUL! Easel die, great idea. Love your card - great colors! I LOVE this card. I love the way you did the sun rays. The sentiment is so wonderful, and I love the idea of sentiments that fit on that wonderful little easel. I can't wait to see the rest of the release! Love the beautiful ink blending! Another great sentiment, paired with great sunshine! Beautifully done! Love the 'clouds' and rays of sun! This is super sweet, love the easel and sentiment!! Neat card. Love the easel die which I know will be a must have. Love that easel die! Gotta have it. Love the card too!!! Beautiful card! Love the easel and sentiment. I love, love, love the sentiment and you paired the perfect paper with it. The easel die is a nust have! Love how you combined the good and the bad (the sun and the dark). I love your sun rays! Excellent card! WOW~ luv the way you created the "clouds"! beautiful card!! the rays of sun are so effective here and so simple and easy to replicate. Thanks for sharing! I love that easel die! Great card! Great gradient colouring and sentiment! WOW you made the colours soo so vibrant! Love the treatment with the clouds! And the sunny-ness of the rest of the card and sentiment! I like the idea of the easel displaying the sentiment - a great, colorful card. Great card. That easel is a MUST have! So cute and unique! What a great layout & love this sentiment! Love the easel die, and the vertical greeting fits so perfectly! Cool! I love the rainy, wet clouds of scalloped paper at the top! Great easel die! That would be fun for my daughter. love the sunshiny card! Great easel...what a perfect frame for a sentiment! Lovely card. Really like the sunshine rays in the background! I love this card! The contrast of colors against each other is perfect! Great card! Love this easel! and the sentiments! Love the watercoloring and terrific use of the easel on your fun card! Such a powerful and true saying...great card. Love this! A great use of the sun rays. Love the watercoloring and the new die! Cheery card with the sunrays. 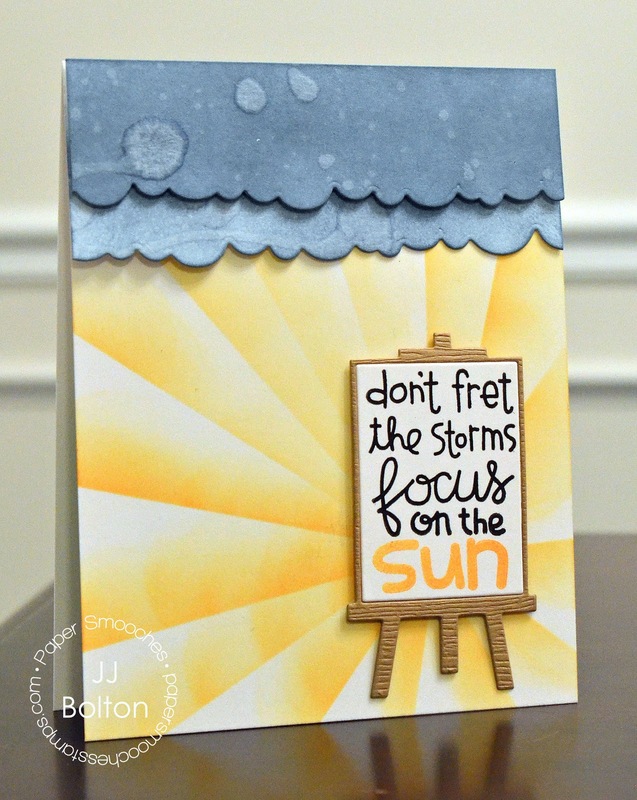 Love the words and the sunshine background on your card! That is BEAUTIFUL and so cheery. I love it! Love the sentiment on the easel and the sunburst behind. Such a simple and beautiful card. I love the colours you used. Thanks for the possibility of the prize. What a beautiful card. I love the sentiment! I lament that I don't have a sun stamp or die then I see what you have done and realize I don't really need one. Thanks. Great sentiment. Like the sun rays, embossing on the easel & sentiment. Beautiful card and a fun blog hop - so much inspiration. Wow,great card,I love the easel! OMGsh this little easel die is definitely on my must have list!! Love the card, thanks for the inspiration! What a great card and sentiment. I love when things match up like that. Excellent! Wow, simple techniques, beautiful card. I love the way it came out. Fabulous card design using these new products. You have definitely created a card that would put a big smile on the recipients face. Love how the sunshine rays look on the card. Love the easel. So cute! Hope more and more stamps come out to use with it! The sentiment is perfect for the layout of your card. They were meant for each other. Thanks. Love the saying on your card. Great card and the sentiment is a wonderful one that I need reminding of often! The flicks of water over the water based inks to represent raindrops is very clever. Cute card. This is a great card with a great sentiment!! Very nice card. Love the sentiment. Your card is definitely uplifting-great work! I love the way you made the rays of the sun. I could use this card for several friends that need a little extra encouragement. I needed this card today--has been a very tough week! Thanks for the encouragement--love this sentiment. what a fun way to do clouds! I love this saying and your card is amazing! I love the colors you used, It's a great card! You are so talented! I always follow you on your blog! This is really nice. I love the stormy sky. What a great inspirational card. Love the "rain" in the sky. Very cute easel. Nice way to display a picture or sentiment. I absolutely love the colors on this card! It is really uplifting. Thanks for sharing! What a beautiful card - goes wonderfully with the sentiment! What a pretty card and encouraging sentiment! Wow love this sentiment and you used it so well on your beautiful card! Love the sentiment! Great card! Love you card. Very neat way of coloring it. I love the techniques used...so simple, yet so elegant. Thank you. LOVE the ADORABLE easel, SWEET sentiment, such a CHEERY design, LOVE IT ALL!!! This is so beautiful! I really like the easel! And the sentiments look like a must-have in everyone's craft stash! 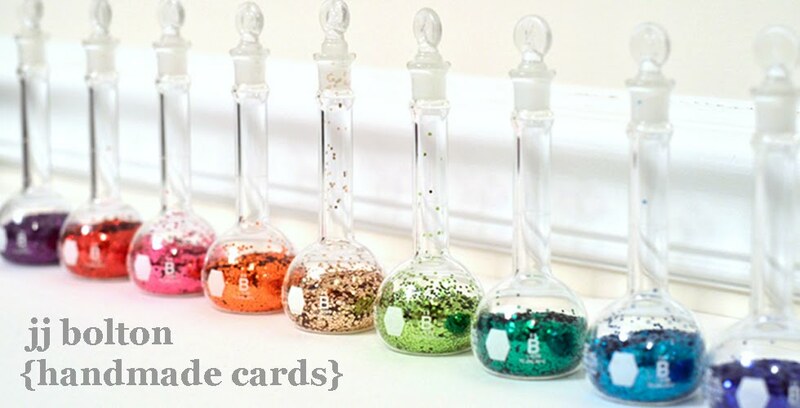 PS: I just tweeted about your card done for this Blog Hop. Love the easel and heartwarming sentiment! Great colors! Love the little details they really make the card special. Such a terrific sentiment and your background sunshine is stunning! Terrific card, J.J.! Love the feel-good sentiment too! Love the water spots on the dark clouds. Really makes it feel like rain. the easel is a really nice touch! Love your card. Especially the storm. Love that shade of blue. Great job! I look forward to see the sunshine stamp set. Thanks for sharing. Great saying and love the card! Great card. Love your sentiment. Fabulous card! Love the coloring on the clouds! Great use of the dies in this card! Love the idea of the sentiment displayed on an easel. Cute card! I am always on the lookout for new sentiment stamps and this one looks like one I need. WOW JJ, I totally love everything about your card. Its fantastic! Shared this hop on my facebook wall. Love that easel. Can't wait to get the die. Fabulous card. Love the colors and sentiment. I like the techniques you used on the blue paper for the storm part, and how easy it is to make sun rays after seeing the beautiful outcome. Good job. Oh, I so want to do this card. You make it sound easy even though I know it was not. That die will be so useful! Sweet! That easel is darling! Fantastic card! Love the colors! Wonderful card. love this new release. Such an awesome card, JJ! I love the scene you created with the clouds and the rays of sunshine peeking through below. Perfect scene for the sentiment! Super cheerful card- sure to make anyone smile!!!! I love how you made the word sun in yellow. I can never get that right. Love your use of the products, design and color! The blue clouds are awesome. This card is so cool, so very excellent and such a good feeling to it!! This is so adorable. Love that easel! Beautiful card! I love the gorgeous sun and sentiment. Thanks for sharing. I love this card and the dies are a must have. Thanks for sharing. Love the new release and love your card. Loving the rays and the woodgrain paper for the easel! I facebooked about the hop. I love your clouds splattered with water. Great sentiment. What an amazing card JJ!!! Love the new easel! Your coloring is amazing! Love the cloudy skies!!! Adorable card! JJ I love your cards. They are alwqays so beautifully done! FABULOUS!! I really "need" the easel die!! Thanks so much for the inspiration! Great card. I love that sentiment. such a great card JJ thanks for sharing!